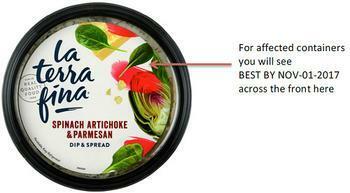 La Terra Fina is recalling 10-oz. containers of Spinach Artichoke & Parmesan Dip & Spread with the date of BEST BY NOV-01-2017. There have been no reports of illness in relation to this product. The best by date can be found on the top label. The correct UPC for the recalled product should be 6-40410-51327-3. However, the affected units may scan as 6-40410-51350-1. Customers who purchased the recalled product and have an allergy to eggs should discard it or return it to the place of purchase for a full refund. Consumers with questions may call La Terra Fina at 855-655-6418 Monday – Friday, 8:30AM – 5PM (PDT).